With the long-deferred plans for the renovation of Lincoln Hall finally coming to fruition, attention has turned to some of the finer points of this landmark structure. Among the lesser known aspects of the building is that it contains a World War I Memorial Courtyard and Fountain. The memorial is in a courtyard that has been open to the public, but which has often been overlooked except by those students and staff who have had to traverse it to get to offices. Nevertheless, the courtyard space has been carefully designed as memorial to serve as an alumni gift to the University. This FAQ provides background information and historic and contemporary photographs. Many additional sources may be consulted by students, faculty, and members of public during our normal hours, 8:30-5:00 pm, Monday through Friday, in Room 19 Library, 1408 W. Gregory Drive, Urbana, IL 61801. What is the World War I Memorial Courtyard and Fountain? The World War I Memorial Courtyard and Fountain are a memorial gift to the University of Illinois from the Classes of 1918 and 1919 on the occasion of their 50th anniversary. It is located in the south light court of Lincoln Hall, partially visible from the main north/south corridor and accessed via a door to the rear of the southeast stair case. The Memorial consists of a landscape design, walkway, plaque, and fountain/monument. The landscape design and fountain monument were developed by Donald Molnar (Class of 1960) a landscape architect in the University’s Physical Plant Planning and Construction Department. Its general design can be seen in a March 12, 1968 Campus Planning office Drawing. What was the concept for the courtyard? 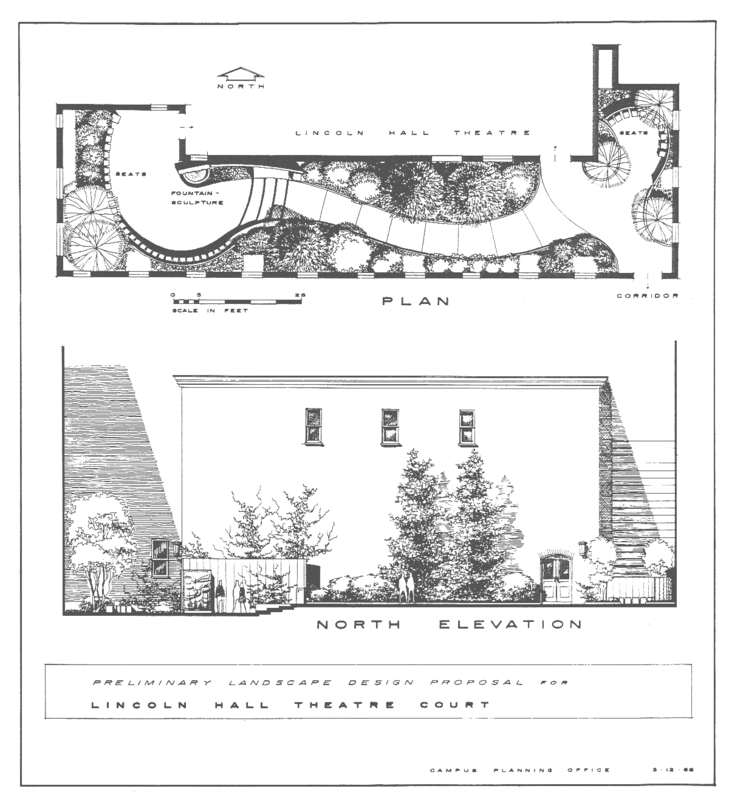 As a class memorial, the courtyard was dual purpose: to provide a pleasant space for Lincoln Hall theater patrons to spend intermissions during performance as well as between-class relaxation and to provide a Memorial for how World War I affect the Classes of 1918 and 1919. 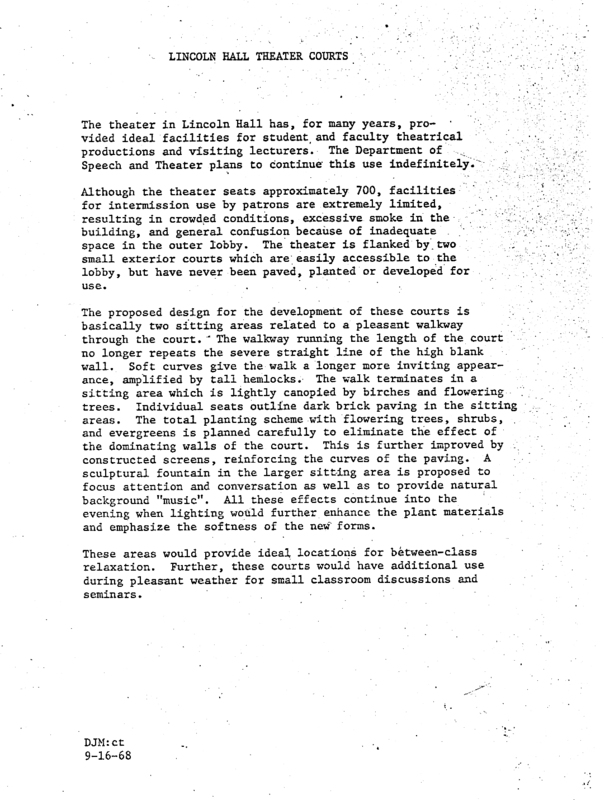 The ideas were explained in a September 16, 1968 memorandum from Donald Molnar. What did the Memorial look like when it was first completed? What does the Memorial look like in 2009? What is the George Halas Connection? 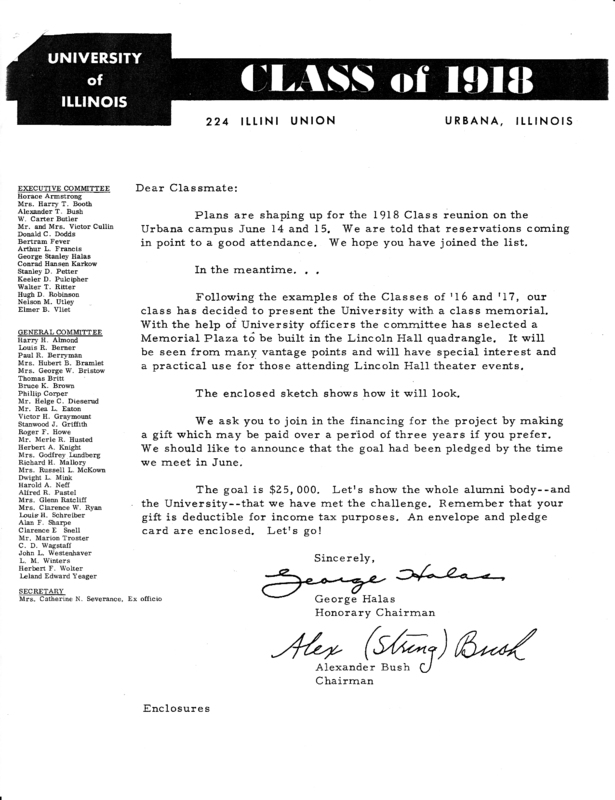 George Halas, a member of the class of 1918 (and founder of the Chicago Bears), served as honorary Chairman of the gift fund committee as seen in the Dedicatory Plaque as well as Halas’1968 letter (with Chairman Alexander Bush) requesting support from his former classmates. What is the meaning of the numbers and symbols on the Fountain/Monument? According to a June 13, 1969 letter from designer Donald Molnar, “The year softly stated at the bottom is symbolic of the relative lack of disturbance as the war began. The 1918-19 years above it and assembled in reverse to symbolize the disruption of these two classes due to the war. The dates above World War I are likewise symbolically confused to indicate the impact on succeeding classes.” These numbers reflect Wold War II, the Korean Conflict, and the then in-progress Vietnam War, in computerized numbers suggesting how impersonal war had become in the 20th century. In addition to the obvious guns and swords, the monument contains plowshares to reflect the midwest farm lands from which many of the class members came.